How much has a human life changed since Bronze Age man walked on the very same fields that we walk on now. There are certain things that are consistent, how life begins, the fact that it will end sometime and the process of growth; from baby to infant, to youth, to adult, to older adult, still exists. How much have political parties dreams for a bright new future, with numerous jobs provided by ICT companies which will reform our economy, where Ireland is a shining example to the whole world. Certain things are consistent; they hire highly experienced, highly priced experts, produce reports, produce action plans, launch the report and are very sincere. In 1999, the Government of the day, released a plan called ” Implementing the Information Society – Action Plan”. It contained many useful suggestions as to how Ireland could be a world leader in the ICT field. In 2013 the Government released a plan called the Jobs action Plan, with plans to make Ireland a European leader in “Big Data”. Which also proclaims to be a way of securing Ireland’s economic recovery. through creating jobs and making Ireland a leader in the area of computing. ‘Big Data’ comprises; all the posts on social media websites, photographs, videos, information from sensors that are use to gather climate information, purchase transaction records, and cell phone GPS signals to mention just a few bits, accumulated it is Big Data. According to IBM, 90% of this data has been gathered in the last two years. Firstly, how many of us want our social media posts or pictures processed, and our transactions used in any way other than to record that a bill was paid, or the GPS position, of our phone at any time used for anything. It seems ludicrous that this information can be made useful enough, to build economic recovery on, by someone, somewhere. It also seems to beggar belief that companies would ignore the far superior communications set up that exists in countries such as Bulgaria, Estonia, Finland, Germany, Holland and Latvia to mention but a few, and choose Ireland. In figures provided by Speed test.net, Ireland is positioned 53rd in the rankings for download speed to houses and in a survey of the top 20 European cities for network speed, no city in Ireland even appears. In fact only Italy, Greece and Cyprus have slower internet speeds than Ireland. Unfortunately,the more familiar situation, particularly in rural Ireland, is the sight of people leaning out their window with their laptop and broadband dongle in an attempt to get enough reception to download a YouTube video. But maybe there is something I am missing, as an aside though in 1992 I wrote to the then Minister for Communications asking him to reconsider putting Eircom on the market as in the future many jobs could be created in Ireland, if we had an independent secure telecommunications system, owned by the country. He was very grateful for the letter or so he said and told me not to worry. The term browsing the Internet or web browsing seems to fall short of an accurate description of the activity. Browsing has always conveyed a sense of leisure, a sort of timeless activity that occurs while on holidays or during a warm sunny Sunday afternoon. It seems far fetched to use this term to describe the activity that takes place when a person is filling out a tax form or taxing their car on the Internet. Web browsing could more accurately be described as “reaching” with every synapse in your brain and muscle in your body reaching expectantly, dependent on the dexterity of your fingertips on the keyboard and/or your accuracy with the mouse, pointing device, to successfully complete important tasks. All Internet users start a web browser in order to locate and read web pages. The first web browser was created in 1990 by Tim Berners Lee the founder of the World Wide Web. In 2012 there are many different web browsers available on many different devices, smart phones and tablets such as the Ipad all have browsers for displaying pages from the Internet. All web browsers are available for download and they are all free. All web browsers can access websites but each browser has its own strengths. Some of the browsers available are Internet Explorer, Chrome, Firefox, Safari and Opera to mention a few. The browser market is very competitive, Internet Explorer, Microsoft’s offering has had the lion’s share of the market since its inception until recently when it was just overtaken by Chrome, a Google development. Safari is the browser that comes with the Mac IOS, Firefox is owned by a not for profit organisation entitled Mozilla who describe themselves as a proudly non-profit organization dedicated to keeping the power of the Web in people’s hands. Each of these highly competitive, each looking to increase its market share of users. Figures for October this year show the following usage. To pick which is the best browser for you is really a matter of personal preference and is dependent on the operating system you have on your computer, i.e. Windows XP/Vists/7/8 or IOS in the case of an Apple Computer Mac and the discussion is beyond the space available for this article, suffice to say there is very little to choose from between the best of the browsers as listed above. All browsers read web sites and each of them have extra functionality which can be added through plugins , extensions or add-ins depending on the browser. Opera has an interesting feature that works in some of its older releases, more particularly releases that work with Windows XP. This feature allows a user with a working sound card and speaker/headphones to have the browser read the text on the screen and those with a microphone can speak commands to the browser, as it is not available in more recent versions it is not quite a solution to the dependence on the fingers and the mouse, but it shows signs of hope for future development and is definitely useful for any one with restricted dexterity. Other extra functionality available in all recent browsers is the facility to translate web pages into many languages, these translations may not always be grammatically correct or totally accurate, however, they provide the ability to understand what is being said in a foreign language website and will also allow people who do not speak English or Gaeilge to understand what is on our websites. Mid Summer has just passed and it is as good a time as any to perform simple maintenance tasks which can help to keep your computer running smoothly. If your preferred machine is an Apple Mac use Software Update to keep the version of the operating system up to date. The Time Machine application provides the facility for automatically backing up your system to an external hard disk and will allow you to restore part or all of your files to the state they were in on a particular date. Remove any unused or unwanted programs from your computer, on a PC this can be done with the Add/remove programs option in the Control Panel. On the Mac locate the program in the Applications folder and drag it to Trash. To organise your work store all of your files in folders in Documents which makes it easier to find them afterwards. Delete unwanted files and empty the recycle bin or Trash. E-mails should be regularly archived or deleted , and remember to empty the deleted items folder or Trash. Disk clean and defragmenting of drives should form part of your monthly maintenance, you can check in the help menu on the computer for instructions on how to do this. 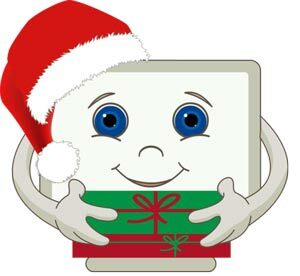 To protect the user of the computer, the people of the make IT Secure project have compiles a list of top ten tips for safe surfing on the Internet. 1. Do use up-to-date anti-virus software, a firewall and anti-spyware. 2. Don’t open email attachments if you are suspicious. 3. Do choose ‘Yes’ to install the latest official security software updates to protect your computer from viruses and phishers. 5. Do make sure your Internet connection is secure when giving out personaldetails – look for the padlock icon. 6. Do make back-up copies of your files and store them in a safe place. 7. Don’t give out personal banking and credit card details by email. 8. Do mark your profile private on social networking sites. 9. Don’t allow your children to meet someone they have only met online without taking you or another adult they trust, along. Not everyone is who they say they are online – people often lie. 10. Do advise your children to be careful when meeting new friends online – if it ‘feels wrong’, tell them to talk to you or to another adult they trust. Further tips and good advice can be found at www.makeITsecure.org. Who said there was nothing to do on a rainy day in the summer. People who provide computer training will do their utmost to convince you that, it is near impossible to survive without having up to date computer skills. It is important for us to examine the truth of this statement for ourselves. There are many things a computer will not do for you, it will not bring you a cup of tea in bed in the morning, it will not cook the dinner, it won’t clean the dishes or more importantly look after your health, it can sit and listen to you, indeed it will allow you to express your opinion to thousands and potentially millions of people, but it will not give you the satisfaction of having shared something with a close friend. The lives people lived through the various ages, over a number of millennia, have a central thread in common, human life needs to be sustained: the ages were distinguished by the tools people used to carry out the tasks of eating, sleeping, communicating, health management, working and travelling. In the Information Age, people use computers to access and share and information with others who also use computers. This requires computer skills. People in Irish society vary from luddites who believe that modern day computing with its apps for everything are an unnecessary waste of time and money to people who will not make a decision in any matter without consulting various opinions using their computer or smartphone. The luddites of the industrial revolution did their best to deny the benefits of the machinery that was central to the Industrial revolution. In Nottinghamshire, groups of textile workers, in the name of a mythical figure called Ned Ludd, destroyed knitting machines, to which they attributed the prevailing unemployment and low wages. Computers have provided access to information that hitherto was only dreamed of, they have connected people in a way that seemed impossible only 20 years ago, you only have to consider the cost of phone calls to America in the eighties as against the free facility provided by Skype. So when people say you have to have computer skills, what they basically are saying is you really do not want to miss the opportunities to access information and the ability to connect and share with others that computers can bring to your life. With the globalization of business, and the increasing number of financial and communication companies owned by corporations, it is useful to know what laws are there to ensure the protection of the individual and their personal information. The main Irish law dealing with data protection is the Data Protection Act 1988. The 1988 Act was amended by the Data Protection (Amendment) Act 2003 which brought our law into line with the EU Data Protection Directive 95/46/EC. The act provides protection for the privacy rights of individuals in relation to the processing of their personal data. We all supply information to banks, insurance companies, telecommunications companies and many others in order to avail of services or satisfy obligations. To find out more detail about the Data Protection Act, www.dataprotection.ie provides full details and some training videos and slide presentations. Spring is here and just before we rush out the door with spade in hand spare a little thought for your limbs which have born the brunt of improper posture over the past winter months. Some people say that human beings will always take the easiest route to complete a task, personally, I do not believe this to be true, but when working at a computer it seems that a lot of people adopt a posture that brings their head as close as possible to the computer keyboard, possibly it indicates the development of a new form of thought transfer, or maybe it is just bad posture. The idea of causing yourself an injury by sitting down working on a computer may seem preposterous, but it is the adoption of the same bad posture day in day out that is the root cause of potential injury, such as repetitive strain injury, upper limb disorder or tendonitis. While these injuries are not as serious as ones caused by improper lifting of heavy objects. They can reduce quality of life for those who suffer from them. There is a science called Ergonomics which is the study of the relationships between tools in the workplace and their users i.e. us. Various products have been produced over time such as wrist rests and ergonomic keyboards and guidelines on the proper posture to be adopted at a keyboard and screen are well documented. These guidelines suit very well to a computer workstation, but do not address mobile computing or computing on the move, which has become a greater part of our lives. It woud be pointless to produce a manual of all the possible position a person can adopt while using a computer, but awareness of posture is very important if you wish to avoid strain or injury. Sitting in a manner that allows the vertebrae to rest on top of one another with the full spine, neck and head aligned, and the shoulders relaxed, is recommended, the Alexander technique offers good guidelines on this. Bringing the head as near as possible to the device may seem the shortest route for our thoughts to the keyboard, but it is ignoring the needs indeed the existence of the rest of the body. The HSE in England produce a useful leaflet on upper Limb disorders this can be downloaded at http://www.hse.gov.uk/pubns/indg171.pdf, the Alexander technique have a web site dedicated to their technique and Ergonomics http://ergonomics.org/. 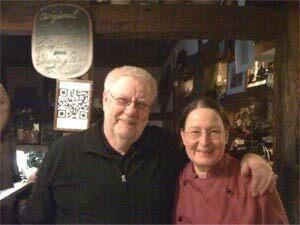 The couple in the picture are Heubert Steuer and his wife they run a restauraunt /accommodation service in the oldest wooden frame house in Germany. The house which was built in the 14th century and has been in Heubert’s family for the past 400 years. In the picture to the left of Herbert’s shoulder is the subject of this article a QRC(Quick response Code), framed and placed on one of the central pillars of the restaurant. This code when scanned by a mobile phone with the relevant app installed, will direct the phone user to the web site www.steuer-garlipp.com . Heubert explained proudly that people could use the code to store his web site address for use when they were away from the place. Neither Heubert nor his wife are in the first flush of youth but they have embraced and are very excited about this technology. A Quick Response Code, or QR Code in its abbreviated form is a type of two dimensional (or matrix) barcode which was first created back in 1994 for use by Toyota subsidiary Denso Wave in the automobile industry. Once I scanned Hubert’s bar code into my phone the web address which is encoded into the image which resembles a cross between a word puzzle and a bar code, Hubert’s web site popped up on my phone, the address of his website was also stored in my phone for reference later on. There are a wide variety of applications of QRC codes at present through out the world, including Heuberts, I would like to suggest one more application that is to place a QRC at each of our heritage sites and panoramic views, the aim of this is to provide more information to people. Monuments such as Gallarus Oratory could have a QRC code displayed at the site which would link the visitors to a web site which would provide historical, archaeological and anecdotal information on the site, in one or more languages and possible other useful pieces of information such as the nearest café, or B&B. Can you think of any uses for these codes?, as Heubert said it is fantastic. http://www.quickresponsecode.com/ is one of many web sites that provide a free service generating QRcodes, These sites include Kaywa (qrcode.kaywa.com), Qurify (qurify.com/en) and Delivr (delivr.com/qr-code-generator). The Google URL Shortener (goo.gl) will also create a QR code file from a shortened link. People who haven’t logged into facebook in a while might be in for a surprise as the new profile which is known as timeline has been rolled out. Timeline will present photos, links and items shared from the past in chronological order. The traditional profile has changed to Timeline which is essentially a scrapbook of all your postings and other peoples postings about you on Facebook, this is in comparison to the traditional profile which presented your most recent activities on Facebook and accessing older posts was time consuming and cumbersome so most people never bothered. It was in fact one of the disadvantages of Facebook in that it only presented you with recent activity. This has all changed, Timeline allows people to jump to the older material more quickly. Unfortunately it doesn’t necessarily take into account the context in which you shared material a number of years ago and the fact some of the photos or opinions you shared, were for your group of friends at that time and represented the attitudes you held at that time. Facebook users might be in for a slight surprise when they realize all their comments made in the full belief of being right or worse under the influence of alcohol will now be accessible to all their friends, a veritable display of skeletons from the cupboard. • You can change privacy settings on individual items to control who has access, or at least hide them so only you can see them. • You can change the date on a post. • For major events in your life, you can click on a star to feature them more prominently. • Instead of your traditional profile photo— you can add what Facebook calls a cover photo. It’s the image that will splash across the top. Keep in mind the dimensions of the image are different and will require a more landscape o wide screen image. • You can add things before you joined Facebook, back to when you were born, which can give a more complete picture of yourself. If you are not sure what works or what doesn’t and what should be hidden or ask your friends who have more experience. The amount of IT skills required by a person or business today depends on what they wish to do. Personally, I believe everyone benefits from basic IT skills with the level of skills to be gained ranging from this to nerd status, defined as an intelligent but single-minded person obsessed with a nonsocial hobby or pursuit. Considering your level of computer skills and deciding whether they require improving can be sticking point for some people. Basic skills include the use of word processing software, Internet browsing, sending and receiving e-mails, storing and retrieving documents, searching for documents and items on the Internet, using folders for storing files and protecting your computer from malicious elements. With these skills to hand a person can avail of a good deal of the advantages provided by IT, such as cheap or free communication with friends and relations using e-mail and Skype, access to public services, e.g. Revenue and motor tax, which incidentally are on the increase, indicatd by the recent launch of the European Commissions e-Government action plan, arranging travel, shopping, checking the market price for an item, sharing and accessing information, online banking and bill payment, discussion of health issues and various forums and self help groups. Technology continues to provides us with an an extended set of options in our lives, both in terms of choice of workplace, access to services, access to a larger market, with greater learning, educational and social opportunities. For us in Corca Dhuibhne it has allowed us to overcome the traditional disadvantages of geographic isolation. Any person using technology within or to promote their business will find that a greater understanding of the uses and applications in their area would allow them to take a more infromed approach to decisions on expenditure. Each person will know themselves if they are comfortable wih the level of IT skill they have acquired. After 31 years of working with information and communication technologies I learn something new if not everyday every week. Looking at all the election poster that have been smiling down at us for the last number of weeks my thought turned to images and image processing, this technology is used by anyone who sends images by e-mail or deals with a web site. Image technology has in my life time moved from where a picture was either black and white or colour, and knowledge of the inner details of photography was confined to enthusiasts and professionals in dark rooms. to a time where pictures are described in various formats; jpeg, png, gif; sizes and resolutions. Most people now have access to or own a digital camera, although it is easy to take a picture, taking a good picture requires understanding of the technology behind digital cameras, which in turn has its own terminology. Pixel which is short for picture element is the basic structure of a digital image. Resolution which describes the number of pixels per inch or centimetre. Take for example a hypothetical picture which as a digital image could be described as being 1800 pixels across by 1200 down with a resolution of 300 pixels per inch, this would give us an image of 6” x 4 “ in size. The amount of disk space that this image would take up is calculated by multiplying the pixels i.e. 1800 x 1200 giving 2160000 bytes or 2.16 Mbytes. The process is commonly called optimizing for the web but effectivly it is image compression, a successful image compression will reduce the size of the image without reducing its quality. To do so, some pixels are eliminated and some are re-elected and placed into the new smaller image. There are a number of methods or more precisly algorithms used to calculate what is the destination of each pixel after compression. So as the posters are taken down spare a thought for the pixels that made a brief appearance in large posters, but are unlikely to be seen again.